The Dooba shop is not open yet. In the meantime, create your Dooba account or sign up for the newsletter to receive updates! noun 415726 cc Created with Sketch. Sign up! First videos of the Trill phone are online! In case you haven't heard already, we now have a GSM/3G mobile phone module for the ioNode (the module is a complete phone). I've personally been using this phone for about 3 weeks now, and so far I'm very satisfied with this. I finally took the time to make some quick videos of the phone in operation. I will try to add more in the coming days. If you're looking for more details on Trill, check out the documentation on source.dooba.io. Be the first to know - sign-up for the newsletter! You read that correctly, I'm talking about a complete GSM/3G mobile phone, based on the ioNode! As explained previously, I've been hard at work for the past half-year putting together this new "module" for the ioNode and writing all of the firmware libraries for it. I also designed a basic plastic case using Blender. My Ultimaker 2 Go printer did take quite a few hours to print all the parts, but the result turned out very satisfactory. I'll try to add more pictures and videos in the coming days. Don't forget to sign up for the newsletter to get all the latest news! I was really surprised by the overwhelming success of the Fiddle during the last Zürich MakerFaire, which attracted an unexpected amount of attention. I took this in and also decided that if we're gonna have the ability to talk on the network, we should also be able to store data. MicroSD being very light in terms of physical footprint and integration, it seemed like a good option. So I went back to Eagle with all this and started re-designing the Fiddle from scratch. Soon enough, I had a new design sent to OSH Park for manufacturing. As soon as I got the boards I started assembling and testing them... THEY'RE AWESOME! Not only do they include A LOT more, but the breakouts (which make the Fiddle a tiny bit wider) provide a much better grip and just make the thing easier to manipulate. The documentation has been updated, you can go check it out here. Go and sign up for the newsletter to get all the latest news! Dooba is an open-source embedded development ecosystem. We design easy-to-use modules and boards for the maker community to build upon. 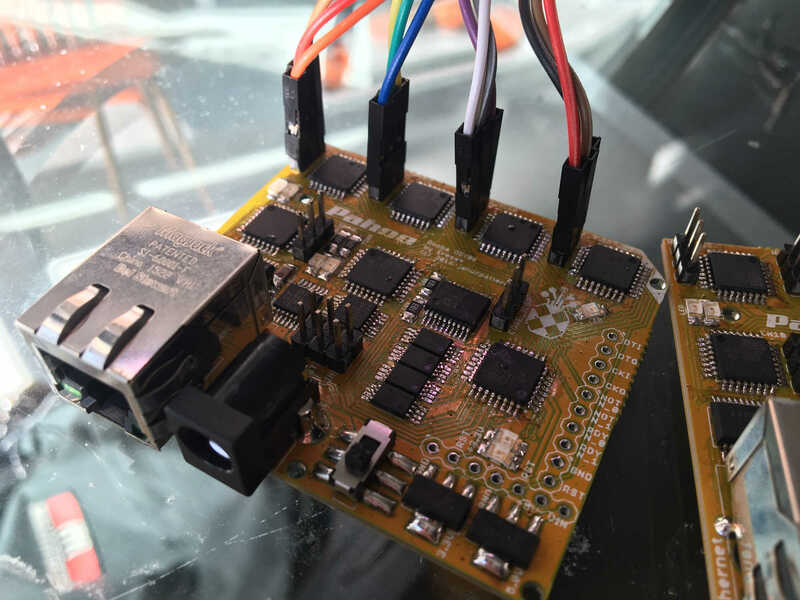 At the heart of the Dooba ecosystem is the ioNode, a basic hardware development board featuring a microcontroller, a USB interface, and a lot of inputs/outputs. To help you build great projects, we also provide hardware modules to achieve specific functionalities such as motor control, MP3 decoding, Ethernet communication and more. To support development of firmware, we also provide a minimalistic SDK which allows extremely fast and straightforward development of firmware components, both simple and complex.